Continuing in their partnership, Deering Banjos and Mumford & Sons have begun their next series of Custom Charity Banjos. Each is signed personally by the band and auctioned benefiting local charities in locations they are touring. Click to see all of the Live and upcoming auctions and bid! When Kentucky, known as the “Blue Grass State”, came up on the tour it was only natural to have the benefiting charity be the International Bluegrass Music Association - Bluegrass Trust Fund! This non-profit was founded in 1987 by Bluegrass music leaders. 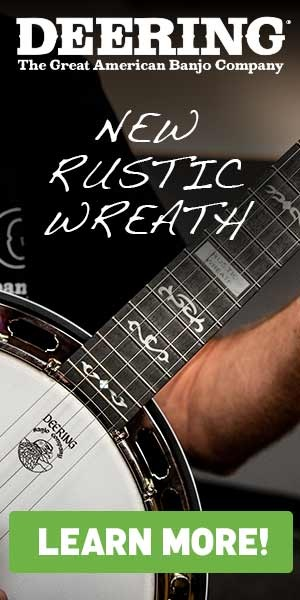 Ever since it has been there to help when life has handed grave setbacks to members of the professional bluegrass musician community. It is a community funded means to offer financial assistance to bluegrass music professionals in time of emergency need. Patterned after similar entities in the music world. When Mumford & Sons played Lexington, Kentucky this week the legendary banjo player J.D. Crowe came out to see them as one of the Bluegrass Trust Fund Board Members. It was a wonderful meeting and sharing of stories and love of the banjo. Pictured above are Ben Lovett and Winston Marshall of Mumford & Sons with J.D. Crowe. The Kentucky banjo is entirely one-of-a-kind, made with a black stained neck bearing the shape and name of Kentucky proudly on the peghead. With Pearloid inlays of blue set into the Midnight Maple fingerboard, paired with its university blue resonator this banjo belongs to Kentucky. 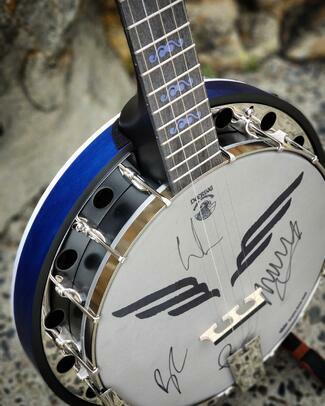 The drum head of the banjo is custom made made by Remo with the Delta Tour Wings Logo and personally signed by Mumford & Sons. 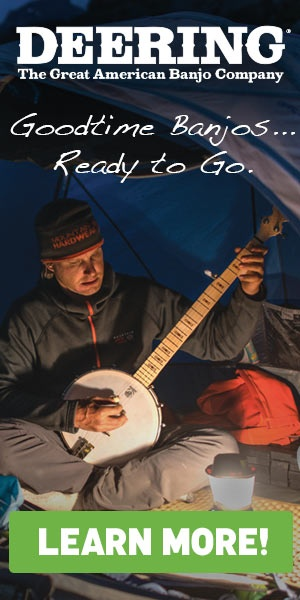 You can see more of the Kentucky Charity Banjo and place your bid on this one of a kind banjo while helping take care of the Bluegrass Community here! Happy bidding and future picking!